Review of “Monika Weiss: Five Video Works” presented in March 2005 at WYSPA Art Institute, Gdańsk. Monika Weiss' actions evolve between the material reality and the world of ideas. Body - matter – form - idea - this way, Monika Weiss’ works combine the two wings mentioned by Polish poet Zygmunt Krasiński. The immediate contact between the viewer and her art creates an intriguing relation. The sensory space, in which the public immerses itself together with the artist, becomes the actual theme, the basis of her performance. And these performative actions in turn become point of departure for next works. Process seems here one of the most important factors. Because the action is not only exposed to the gaze of the viewer, but it also happens within the public space. Together with the captivating process, the immersion of the viewer, at the core of Monika Weiss’ actions and their meaning is a sense of limitation and boundary. Understood on many levels. It is most of all the experience of one’s own body by the artist, but also forcing the public to endure a certain state for a long period of time. This kind of action calls to mind ritual as a way to define art, and what happens to the artist, in what relations she or he is entangled within reality, space, matter, and public. Her works have indeed a lot to do with the traditions of the second avant-garde, the actions undertaken by the artists in the 60s and 70s, aimed at escaping from the institutional rules, from the harsh laws of the art market, which became extremely repressive to the artists. On the one hand Monika Weiss’ drawings created as a result of performances relate to certain affectivity translated into visual means, the acting based on an impulse. On the other hand the act of drawing using her body has also a historical context. In the case of many projects realized by Monika Weiss, we observe an interesting transformation, and a total reinterpretation one could say, of the actions by Ives Klein from 1960s, around the series of "Anthropometries". It is an interesting comparison, also in the context of women’s art, the art that deals with female body. There, in Ives Klein’s, bodies of women, which were once again, models, where directed, conducted by the man - artist. In Monika Weiss' realizations we encounter a situation produced by a woman - artist, who submits her own body to diverse impulses and long-term processes. WYSPA Art Institute presented recently five video works by Monika Weiss. Her projects combine an in-depth analysis of cultural situation, in which the body functions—a body of a woman—with an esthetic pleasure, which we see very rarely, especially taking into consideration the problematic that the artist raises. All of her works presented at WYSPA, contain certain static quality, despite the movement, which, realized minimally, signals long-term and process-based performances, which become points of departure for the presented video works. An important component in all of her works is the sound. It exudes from the mind, from the perceptive organs, additional experiences resulting from these works. At times the sound is able to say more then the image. Movement, sound, process, avant-garde traditions, body - these are the important components and issues, which Monika Weiss’ work is involved with. 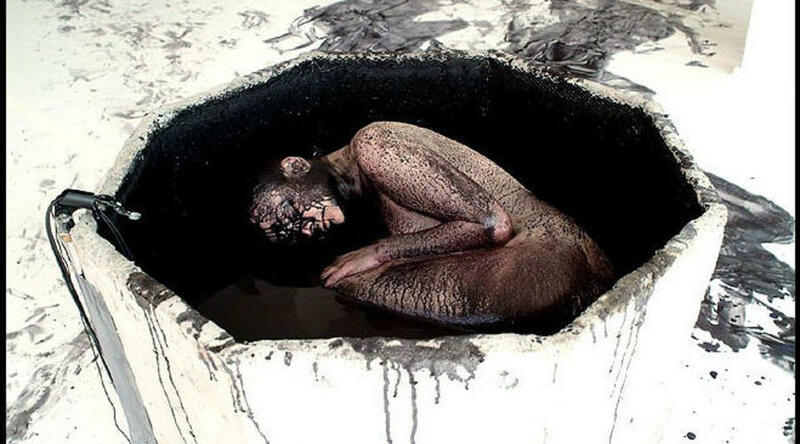 Presented at the WYSPA Art Institute video "Ennoia", which is based on a six-hour long performance, similarly to most of her work, is saturated with the multitude of meanings. First remark that appears in the mind of the viewer is the distance separating the artist, her surrounding reality, from the position of the viewer. The gaze of the observer seems to encompass much more then it is usually possible for an average viewer. The reality is perceived from above the normal horizon. Certainly the question of normality appears, which remains relative. The body, curled up in an embryonic position, floats inside an octagonal baptisterium. It moves gently, brushed by the surface of water, in which it is immersed. Natural limitation of the body becomes an enforced state. The sacralization of body and the interspersion of the religious ritual onto the body, also inscribes itself into the idea of limitation, of tracing, mapping, creating boundaries, barriers, and limits for oneself. One of the recent projects by Monika Weiss, “Phlegethon-Milczenie”, deals with a slightly different issue. The key concept is this other ‘wing’. Intellectual heritage and its experiencing is submitted to the destruction. At first it becomes the object of contact – a relationship, which establishes itself, between corporeality and spirituality. Thousands, perhaps even millions of pages of esteemed thoughts, statements, theories, were submitted to gradual degradation, destruction. This work speaks about a painful experience of the gradual disappearance of ourselves. The desire of knowledge defines the participation of each human being in the reality. The absence of one of the directions of the functioning can cause an unsettling of the delicate construction. When one of the wings is missing, the other won't help us in anything and we will fall faster then we can think about it. Monika Weiss’s works release in the viewer a desire to capture that moment for longer. Despite the fact that often some limitations or barriers are imposed on the viewer. The esthetic pleasure is certainly one of the factors of this state. But it is something more: sensuality, security, pain, memory. Perhaps exactly these ambiguous feelings and states, which also the viewer can experience, liberate the perceptive desire.